Also available in Chime-Enhanced, Java (Jmol) and VRML versions. 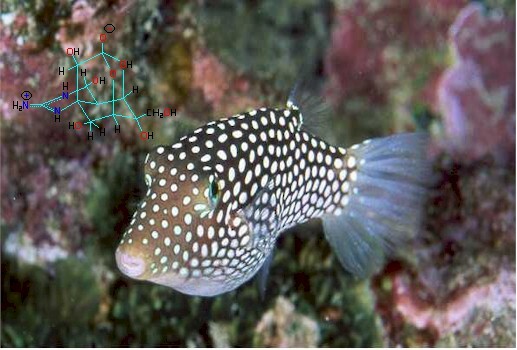 Tetrodotoxin (TTX, CAS Number [4368-28-9]) is a potent marine neurotoxin, named after the order of fish from which it is most commonly associated, the Tetraodontiformes (tetras-four and odontos-tooth), or the tetraodon pufferfish. The tetraodon puffers are equipped with four large teeth which are nearly fused, forming a beak-like structure used for cracking mollusks and other invertebrates, as well as for scraping corals and general reef grazing. The members of this order include the fahaka puffer (Tetraodon fahaka), the Congo puffer (Tetraodon miurus), and the giant mbu puffer (Tetraodon mbu). Pufferfish from the genus Fugu (F. flavidus, F. poecilonotus, and F. niphobles), Arothron (A. nigropunctatus), Chelonodon (Chelonodon spp. ), and Takifugu (Takifugu rubripes) also store TTX and related analogs in their tissues. Other marine organisms have been found to store TTX and include the Australian blue-ringed octopus (Hapaloclaena maculosa, uses TTX as a toxin for capturing prey), parrotfish, triggerfish, goby, angelfish, cod, boxfish (Ostracion spp. ), tobies, porcupine fish, molas or ocean sunfish, globefish, seastars, starfish (Astropecten scoparius), xanthid crabs (Eriphia spp. ), a horseshoe crab (Carcinoscorpius rotundicauda), two Philippine crabs (Zosimus aeneus and Atergatis floridus), a number of marine snails, flatworms, sea squirts, ribbonworms and arrowworms (which both use TTX as a venom for prey), molluscs (Nassarius spp. and the Japanese trumpet shell "Boshubora"), and marine algae (Jania spp.). 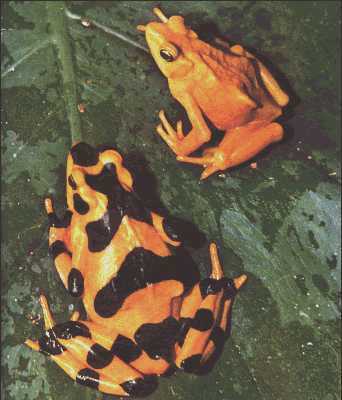 Terrestrial organisms include the Harlequin frogs (Atelopus spp. ), Costa Rican frog (Atelopus chiriquiensis), three species of California newt Taricha spp., and members of the Salamandridae (Salamanders). The number of species continues to grow. Blue-ringed Octopus and two Harlequin frogs. TTX is an especially potent neurotoxin, specifically blocking voltage-gated sodium channels on the surface of nerve membranes. The molecule consist of a positively charged Guanidinium group (resultant cation is resonance stabilized - see stick model below where the guanidinium group, which consists of three Nitrogen atoms, is outlined in blue - and which gives the name to this class of neurotoxins , q.v., guanidinium toxins) and a Pyrimidine ring (shown in red in the stick model below) with additional fused ring systems (these additional ring systems, of which there are five in total, contain hydroxyl groups which must certainly help stabilize the TTX-sodium channel binding complex at the aqueous interface). The TTX-Na Channel binding site is extremely tight (Kd = 10-10 nM). TTX mimics the hydrated sodium cation, enters the mouth of the Na+-Channel peptide complex, binds to a peptide glutamate side group, among others, and then further tightens it hold when the peptide changes confirmation in the second half of the binding event. Following complex conformational changes, TTX is further electrostatically attached to the opening of the Na+ gate channel (2d event occurs in vivo as the dehydration of the aqueo-sodium complex). TTX's tenacious hold on the Na+-Channel complex is further demonstrated by the occupancy time of TTX v. hydrated-Na+ at the complex. Hydrated sodium reversibly binds on a nanosecond time-scale, whereas TTX binds and remains on the order of tens of seconds. With the bulk of the TTX molecule denying sodium the opportunity to enter the channel, sodium movement is effectively shut down, and the action potential along the nerve membrane ceases. A single milligram or less of TTX - an amount that can be placed on the head of a pin, is enough to kill an adult. The first symptom of intoxication is a slight numbness of the lips and tongue, appearing between 20 minutes to three hours after eating poisonous pufferfish. The next symptom is increasing paraesthesia in the face and extremities, which may be followed by sensations of lightness or floating. Headache, epigastric pain, nausea, diarrhea, and/or vomiting may occur. Occasionally, some reeling or difficulty in walking may occur. The second stage of the intoxication is increasing paralysis. Many victims are unable to move; even sitting may be difficult. There is increasing respiratory distress. Speech is affected, and the victim usually exhibits dyspnea, cyanosis, and hypotension. Paralysis increases and convulsions, mental impairment, and cardiac arrhythmia may occur. The victim, although completely paralyzed, may be conscious and in some cases completely lucid until shortly before death. Death usually occurs within 4 to 6 hours, with a known range of about 20 minutes to 8 hours. From 1974 through 1983 there were 646 reported cases of fugu (pufferfish) poisoning in Japan, with 179 fatalities. Estimates as high as 200 cases per year with mortality approaching 50% have been reported. Only a few cases have been reported in the United States, and outbreaks in countries outside the Indo-Pacific area are rare. Sushi chefs who wish to prepare fugu, considered a delicacy by many in Japan, must be licensed by the Japanese government. The comparative toxicity of TTX is summarized by William H. Light. "[W]eight-for-weight, tetrodotoxin is ten times as deadly as the venom of the many-banded krait of Southeast Asia. It is 10 to 100 times as lethal as black widow spider venom (depending upon the species) when administered to mice, and more than 10,000 times deadlier than cyanide. It has the same toxicity as saxitoxin which causes paralytic shellfish poisoning ([both TTX and saxitoxin block the Na+ channel - and both are found in the tissues of pufferfish]) A recently discovered, naturally occurring congener of tetrodotoxin has proven to be four to five times as potent as TTX. Except for a few bacterial protein toxins, only palytoxin, a bizarre molecule isolated from certain zoanthideans (small, colonial, marine organisms resembling sea anemones) of the genus Palythoa, and maitotoxin, found in certain fishes associated with ciguatera poisoning, are known to be significantly more toxic than TTX. Palytoxin and maitotoxin have potencies nearly 100 times that of TTX and Saxitoxin, and all four toxins are unusual in being non-proteins. Interestingly, there is also some evidence for a bacterial biogenesis of saxitoxin, palytoxin, and maitotoxin....[i]n living animals the toxin acts primarily on myelinated (sheathed) peripheral nerves and does not appear to cross the blood-brain barrier." The structure of TTX was elucidated simultaneously by an American and two Japanese groups in 1964 (Woodward, R. B., Pure Appl. Chem. 1964,9,49-74; Goto T., Kishi Y et al. Tetrahedron 1965,21,2059-2088; Tsuda, K., Ikuma, S. et al. Chem. Pharm. Bull, 1964, 12,1357-1374 - see Nobel Prize link below). The racemic synthesis of TTX was accomplished by Kishi (now at Harvard) and his co-workers in 1972 (Kishi, Y. et al. J. Am. Chem. Soc. 1972, 94). To date the Kishi-Goto pathway is the only successful synthetic route to TTX that has been accomplished. A few intermediates in the synthesis of TTX, a 15 step process, is shown below. The synthetic reactions include a ketalization, a Meerwein-Ponndorf-Verley reduction, selenium oxidation, epoxidation, a Diels-Alder cycloaddition and other techniques. To date little is known regarding the biosynthesis of TTX. No one has yet isolated enzymes responsible for the biosynthesis, but Kotaki and Shimizu (Journal of the American Chemical Society 115:3, 829) have put forward a feasible biosynthetic scheme in which either an adipose sugar or isopentenyl-PP group is linked to the amino acid Arginine (see below). This is a remarkable example in biochemistry in which simple starting materials are linked to form a compound as complex (and stereospecific) as TTX. Puffer fish grown in culture do not produce tetrodotoxin until they are fed tissues from a toxin producing fish. 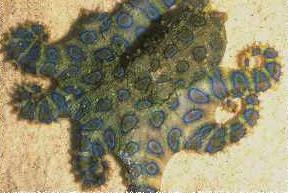 The blue-ringed octopus found in Australian waters accumulates tetrodotoxin in a special salivary gland and infuses its prey with toxin by bite. This octopus contains tetrodotoxin-producing bacteria. Xanthid crabs collected from the same waters contain tetrodotoxin and paralytic shellfish toxin. It is now clear that marine bacteria have long been in mutualistic symbiosis with marine animals. Pufferfish, millions of years ago, took advantage of a single point mutation in their sodium channel receptors which rendered these fish immune from the effects of TTX. Similar adaptations have been made by organisms carrying saxitoxin, ciguatera and others. It is now known that the related toxins tetrodotoxin and anhydrotetrodotoxin are synthesized by several bacterial species, including strains of the family Vibrionaceae, q.v., Pseudomonas sp., and Photobacterium phosphoreum. Following herbivores grazing, marine invertebrates and vertebrates accumulate these bacteria, provide them with a suitable host environment, and in return receive the protection of marine biotoxins, compliments of the prokaryotes. "Of particular interest are sodium channels in jellyfish (Phylum Cnidaria) and flatworms (Phylum Platyhelminthes). We have shown that sodium currents in the jellyfish are completely insensitive to the potent sodium channel blocker tetrodotoxin (TTX), while those in flatworms, often considered to be the closest extant relatives of cnidarians, are sensitive to TTX. We are now using molecular cloning techniques to identify the structural changes that accompany the evolution of the TTX receptor. We have already cloned a sodium channel from a jellyfish, and have partial sequence from the flatworm. The amino acid sequence of jellyfish channel is remarkably similar to that of mammalian sodium channels despite their having separated from the mammalian evolutionary line close to one billion years ago. This similarity implies that there are severe constraints on the evolution of these channels; constraints that should help us identify the structural basis of TTX binding." "An association between TTX-producing bacteria and higher organisms appears to offer clear advantages to both partners. The bacteria get a safe place to live, eat, and reproduce. And the hosts use the toxin for predation or defense or both. The ribbonworms, arrow worms, and blue-ringed octopuses employ TTX as a potent venom for securing prey, but for the octopuses, it is also a very effective defense. When molested, western newts arch their sooty-black backs, revealing brightly colored, red-orange ventral surfaces. (Red-and-black is a common warning color pattern in nature that indicates a dangerously toxic or venomous animal.) Slow-swimming and clumsy pufferfishes, which without their defensive poison would be easy prey, are generally left alone by predators. The Japanese tiger pufferfish, Fugu rubripes, has been the subject of intensive genetic sequencing studies. A single point mutation in the amino acid sequence of the sodium-ion channel in this species renders it immune from being bound and blockaded by TTX [italics the authors]. Changing the amino acid sequence of any protein alters its structure, and therefore its function. Such spontaneous mutations occur all the time in animal populations. Most such changes are neutral or disadvantageous to an organism's survival, but occasionally one confers a selective advantage. In the case of F. rubripes, one tiny change enabled the fish to incorporate TTX-producing bacteria into its tissues and use the toxin to its own advantage." It is interesting to note that TTX and another shellfish poison, saxitoxin, are molecular mimics of one another. They are both nearly equally potent Na+ channel inhibitors, both bind in similar fashion to the outer enzyme complex of the gated Na complex, and both produce similar physiological responses. These molecules serve as an excellent example of convergent biochemical evolution, saxitoxin arising from marine cyanobacteria, tetrodotoxin from marine prokaryotes.